Add a kitchen wine rack to your counters with Kitchen & Bath Depot! If you’re considering unconventional ways to remodel your kitchen, consider adding a wine rack. You can make your kitchen counters a way to show off the wine and draw the eye. With a kitchen wine rack, you can organize your wines by age, type, and flavor as well as make them easier to get to! 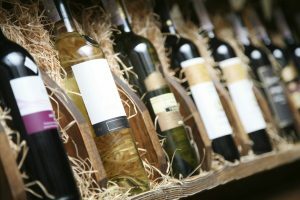 Read on to learn more about putting a wine rack in beneath your kitchen cabinet. The first step is to find the right place to put your new kitchen wine rack. Keep your bottles away from any kitchen appliances that could disturb them. Disturbing the bottles might cause unwanted changes in temperature or shake the bottles – wine should never be shaken, especially if what you have is sparkling wine. If the space underneath your kitchen counter is an area where family members and pets will frequently bump into it by accident, consider choosing a different location. If you don’t already have a place in mind, you could always decide to have a kitchen island installed. The kitchen island can be split between serving as a wine rack and as a food prep area. Chances are, the space below your countertop is a set of cabinets. The next step in the process of installing a wine rack involves removing the doors and shelves from the cabinets. It might be necessary to have some custom work done. If not, you can just insert the wine rack of your choice. But you could always select a wine cooler instead of a conventional wine rack. Whatever you decide to do, you should also call upon a professional remodeler or woodworker to ensure you do this part right – after all, you will need to be sure you have the correct materials and structure to accommodate the weight of the bottles you plan on storing. Making the right measurements is an essential component of completing this task as well. Lastly, don’t forget to select any other features or upgrades you would like to include. If you also wish to have a larger-scale kitchen remodel, you can have new kitchen cabinets installed to match your new wine rack. Prefabricated racks and vertical shelves instead of traditional horizontal ones are viable options to choose to help jazz up your new kitchen counter. This entry was posted on Friday, August 11th, 2017 at 3:21 pm. Both comments and pings are currently closed.